I have been following Ather Energy since a few years now. Since past few years the photos of Ather Energy’s proposed e-scooter was going rounds. They did some road show which I couldn’t attend and they also did a PR drive to get some publicity before seeking funding. At that time I was little skeptical- they didn’t have a working model that media could ride around and experience- only a prototype and a vision/promise. Eventually Hero Group invested a large sum in Ather Energy, I did list them in “startups to watch in 2018” list I had made earlier. The good news is, about a month or two ago Ather Energy has released working models of their e-scooter, introduced in two variants named 340 and 450. Many members of the media have driven it and Ather has launched an experience centre in Bengaluru for prospective buyers to experience the bike. 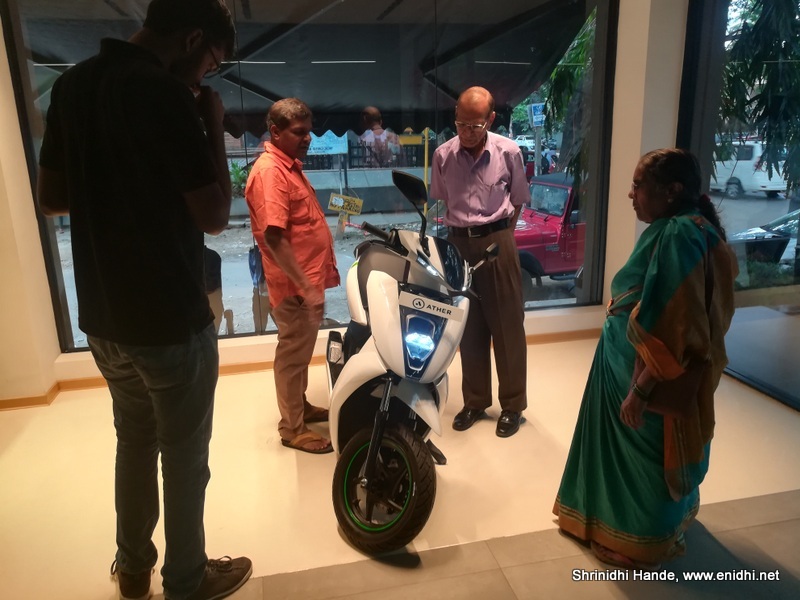 When I had a Bengaluru trip planned, I decided to walk in and test drive this new promising electric scooter. However it looked like one should register on their website for test drive. When I tried in June for July 21 slot, it was showing ‘sold out’. But I tried again 10 days before and I could book a slot. Looks like test rides can now be booked for next few days only. I was told that during early days lots of people registered but few turned up- now things have normalized- you can probably even walk in and try. As per the plan on the scheduled date and time I walked in. I was greeted by a staff. Before the test drive, I got some briefing about the vehicle. I had my research and had gone there with a set of question- all of them were answered by the staff. I have explained all likely FAQs already in this earlier post- for quick answers refer the same. This post shares a more detailed experience. Ather has designed everything in house- frame, chassis, body panels, touchscreen system and so on. This could be one of the reason they took some sweet time to launch. Doing everything in house has given them full control and freedom and of course a unique product. Ather electric scooters are targeted at city commuters who travel short distance within the city. 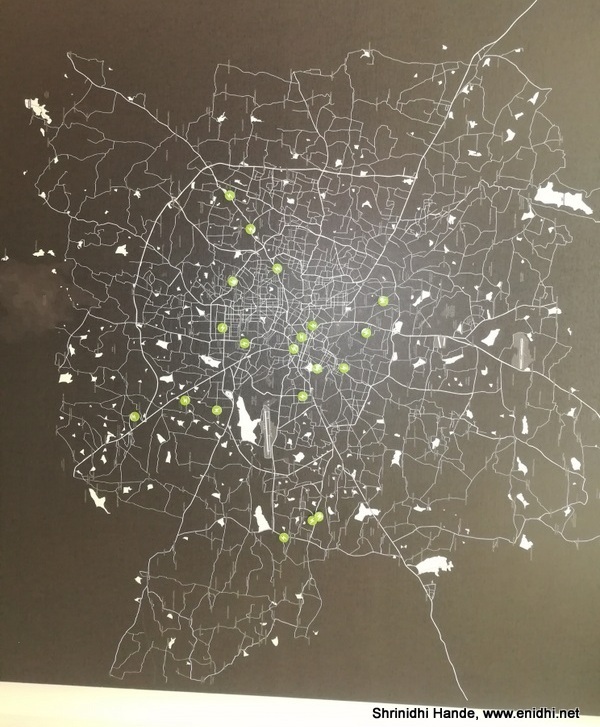 I was told as per their research average use of scooters/mopeds in city is about 30 kms per day. If you’re someone going from one end of city to another each day- like 100kms a day round trip, Ather is not for you. 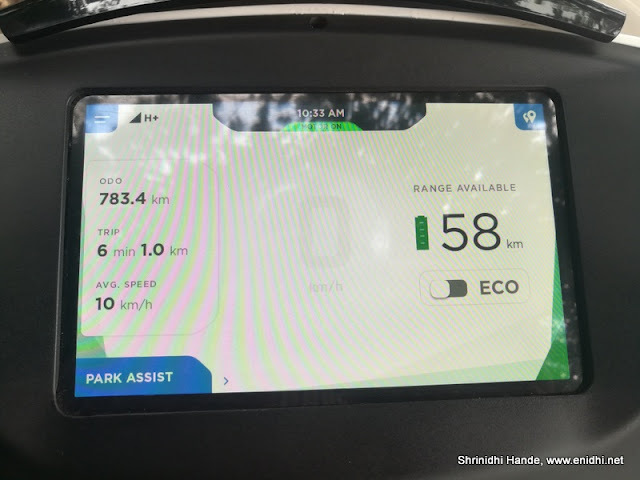 Ather’s electric scooter gives a range between 50 to 75km (depending on mode used, model of scooter etc) which is more than adequate for most of its target customers. Petroleum resources are limited. Fuel prices are continuously on the increase and few decades from now, they will be unaffordable or may totally exhaust. Thus countries world wide are trying to move to renewable sources of energy. Denmark wants to be fossil fuel free by 2050. Electric vehicles are the best way forward and will probably be the only option 2-3 decades from now. Companies like Ather are bringing that future today, so that we can adapt earlier to electric vehicles. Despite the financial considerations and other limitations, it is important for public to support electric vehicle manufacturers, so that the industry doesn’t die down and can grow and improve. We were explained the features of Ather electric scooter. I will try to summarize it for you here. Body- Ather 450 and 340 are built using an all aluminum body (not plastic like other mopeds) which makes it light and more durable. The central frame is steel for obvious reasons but rest is aluminum. Engine naturally gets an automatic transmission and power is transferred to wheels using a belt. Now belt transmission is NOT the most efficient way of transferring power- almost all motorbikes used chain transmission- only Harley Davidson uses belt. But I can understand use of belt here- chain would make more noise and more friction. Belt is more silent. Another drawback of belt is that there’s nothing to repair- if it fails, you’ve to get your vehicle towed to service centre and put a new belt. Chain on the other hand, if broken, any roadside mechanic can fix it and you can reach your destination. One good thing about brushless DC motor is that there’s nothing to idle. It is ready to roll on power supply and stay completely silent otherwise- when Ather 450 was turned on, only way we can know that it is ON is the green status on the display. Otherwise absolutely no noise upon starting. I think it may help if ather can add a fake engine noise in the touchscreen tablet for the comfort of owners. 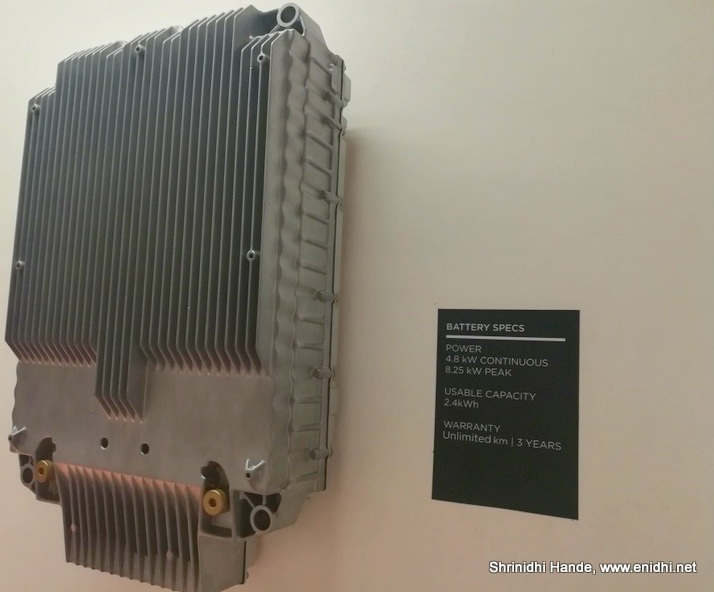 The most critical component of an electric vehicle is its battery. It costs as much as one third the cost of vehicle. It is same for Reva or other electric vehicles. 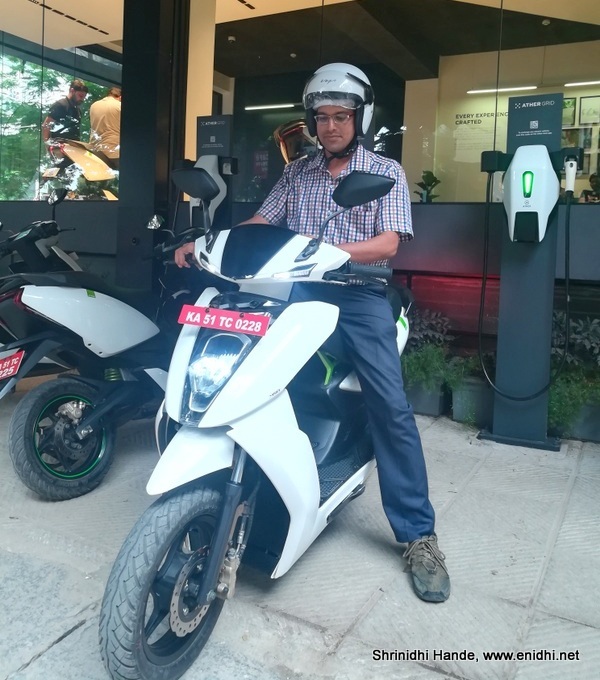 Now most electric vehicles, including Ather use Lithium Ion batteries. Ather 450 uses a more powerful 2.4 KWH one while 340 uses a 1.92 KWH battery. Battery is positioned at the bottom of foot rest-where rider keeps their legs. 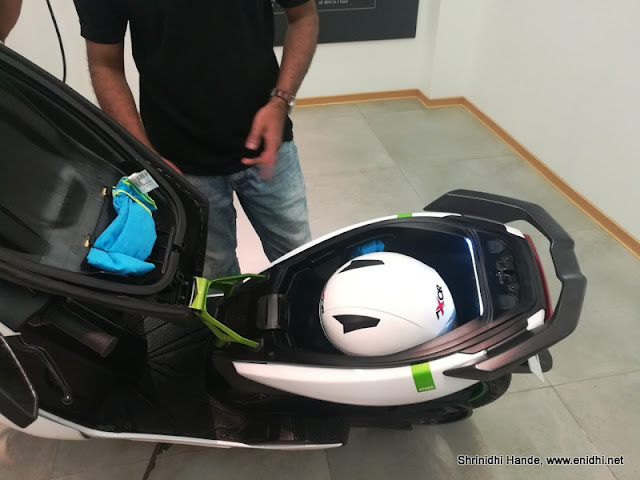 Battery being heaviest component, this positioning lowers centre of gravity, helps in an almost equal weight distribution (51% front, 49% rear) and free up space under the seat for full face helmet and other stuffs. I asked if battery will be safe in its position- what if some heavy objects are kept on it, or some stones hit during ride or it gets submerged during rain. I was assured that all these possibilities are considered and battery is fully safe in its position. Just like your mobile battery, Ather’s battery range would diminish over time. But ather claims less than 10% degradation per year and expects battery to last 5 years or more. Official warranty is 3 years/unlimited kms. So my guess is somewhere between 4 and 5th year the battery performance/range gets too poor for practical use, forcing you to replace. Actual life may depend on multiple factors- fast/slow charging, load cycle and so on. Eco Friendliness: Electric vehicles are granted a green status- that they don’t pollute the environment. But there’re some facts we should keep in mind. Two third of electricity in India is produced via non renewable sources- natural gas, coal, petroleum etc. So though EV doesn’t pollute while it runs, the electricity it consumes has already caused some pollution while it was generated. It is probably still better that EVs don’t pollute already polluted cities more. Second- Lithium Ion batteries need to be disposed scientifically. Else they will cause a environment hazard. 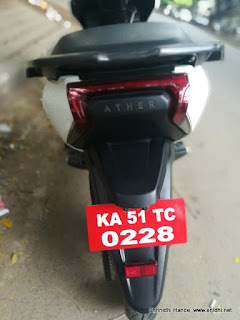 Ather doesn’t have a process to recycle/dispose off batteries scientifically yet- but they have time- like 4-5 years- till first batch of Ather scooter batteries come up for replacement. Ather says they are exploring multiple options in this regard. It is important that recycling/disposing is facilitated at no cost to owners- else owners will simply throw it away, causing lots of eco-damage. Lots of storage: Underseat storage can hold full face helmet, gets a light. But no USB charging (which is getting common in newer two wheelers- would have been a useful feature- can still be provisioned- there’s already wiring for light in under-seat area- need to provide USB somewhere around. Front and rear disc brakes- Ather gets rear brake on both front and rear. New design side stand- side stand fits smartly into foot rest area. Multi function touch screen display- the main highlight of Ather electric scooter is its interactive touch screen tablet sized display- it shows typical information like speed, range, time etc and can be used for navigation. It also logs lots of vehicle and movement data for later analysis. There is an incognito mode if you don’t want ather to track your movement, but this has to be done each n every time. 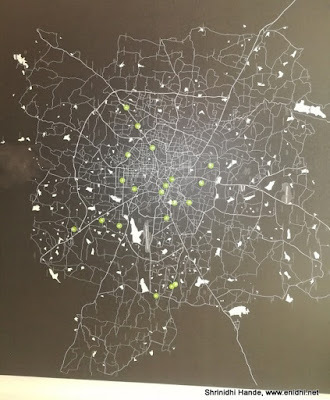 Any post on Ather will be incomplete if I don’t mention the effort they are taking to set up charging infrastructure all over Bengaluru. 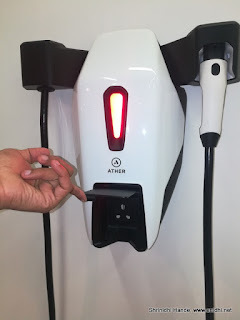 They’ve already setup lots of charging stations (22 and counting), known as Ather Hub- now accessible for free even for non Ather electric vehicle. 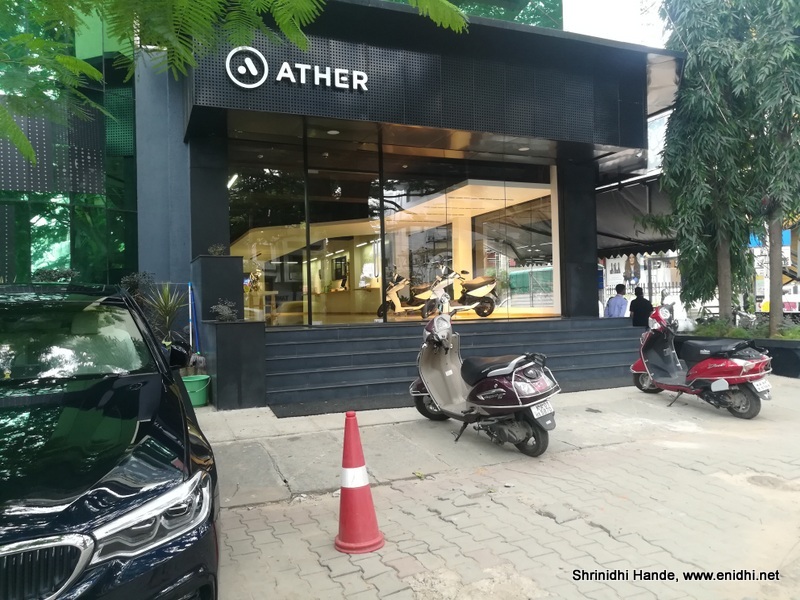 Ather is trying to ensure that wherever you’re in Bengaluru, there’s a charging point within 4 km distance. This will give lots of confidence to customers- that if they run out of charge, they can go to nearest Ather Hub and get their vehicle charged. These hubs have fast chargers- which can charge up to 80% in about an hour. What happens if all charging points are occupied? This is something that needs to be solved not immediately but may be after lots of Athers are sold. May be they can show actual availability on an app and give a booking like feature. Like any vehicle, Ather 450 electric scooter has moving parts, is subjected to elements and will need maintenance. 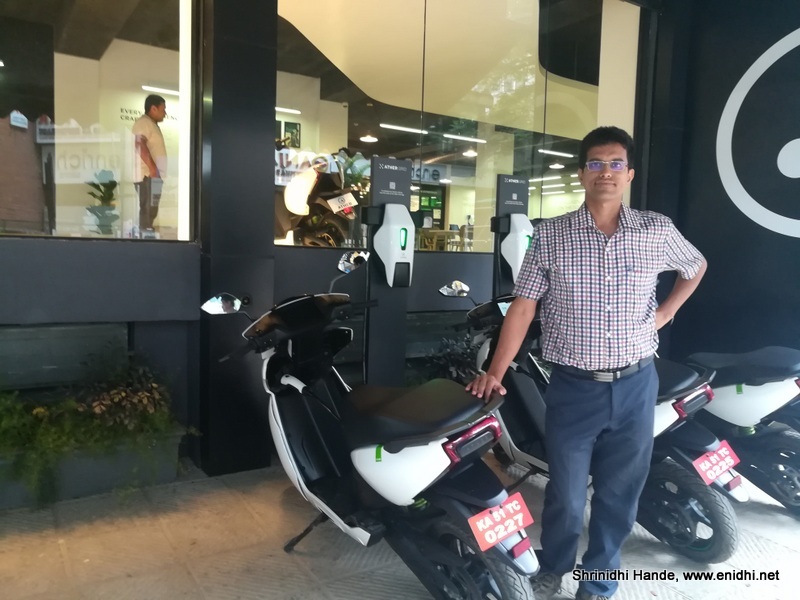 Ather is providing a maintenance package known as Ather One- It is free for initial customers for first year and will cost Rs 700 + GST per month. Ather One subscription gets you road side assistance in case of break down, a data card for the touchscreen (for navigation, data capture a sim card is needed and this costs money), regular maintenance and some of the consumables. You may take a chance and opt out of Ather One and save some 800 Rs a month but in case of breakdown and repair you may end up spending much more. Some other expenses such as insurance (Rs 3500 per year), tyre replacement (some 5000 for 30000-40000 kms), battery replacement (about Rs 40000 after 4-5 years) etc will be additional expenses. I have planned a separate post comparing economics of owning Ather 450 or 340 vs Honda Activa or Bajaj 200 NS. These additional expenses are the reason why electric vehicle's turn out to be expensive to own overall, though actual cost of running is very very less. When I got ready for a test drive, I was given about 10 minutes time and I was free to go anywhere around. I rode around nearby streets- the ather 450 is very silent at low speeds, makes some noise while accelerating or in high speeds, but obviously much less than petrol vehicles. The acceleration, speed and riding comfort is excellent- at par with its petrol rivals. Ather isn’t too heavy either and very convenient in city traffic. I did another round sitting pillion, with Saakshi Rajat riding. She was also impressed with the vehicle. Ather 450 is perfect for running around town. So is Ather 450 good purchase? You wish to take pride in being early customers of new generation of electric vehicles. 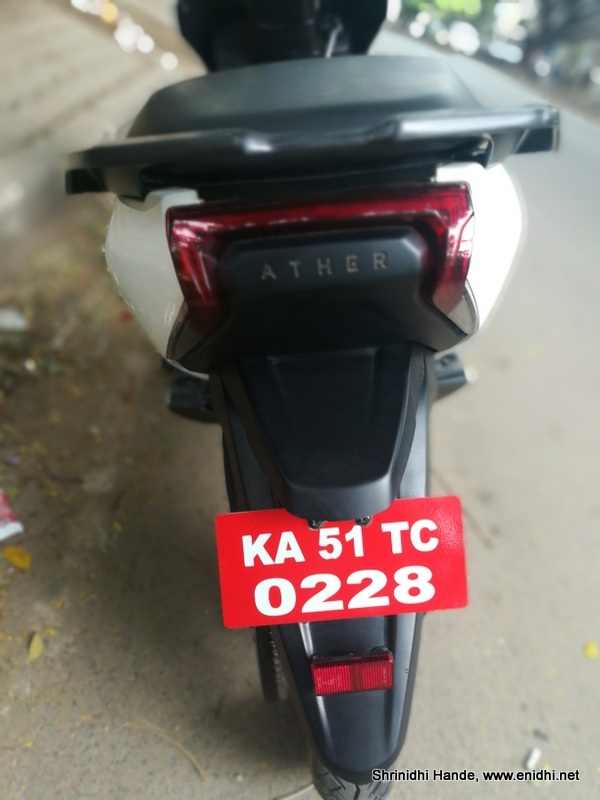 Ather is currently available in Bengaluru only and is expected in other cities soon. 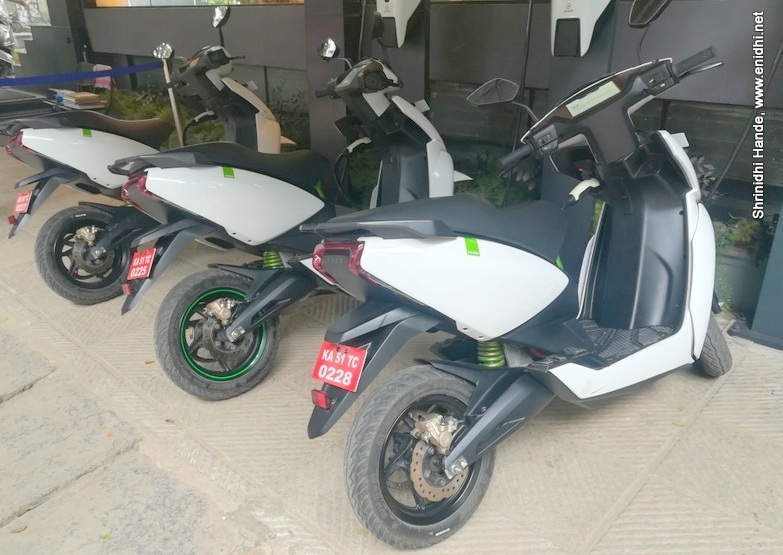 Over 1000 people have booked Ather electric vehicle so far and deliveries are expected to begin in August- so you should be seeing more n more of these in the roads of Bengaluru. 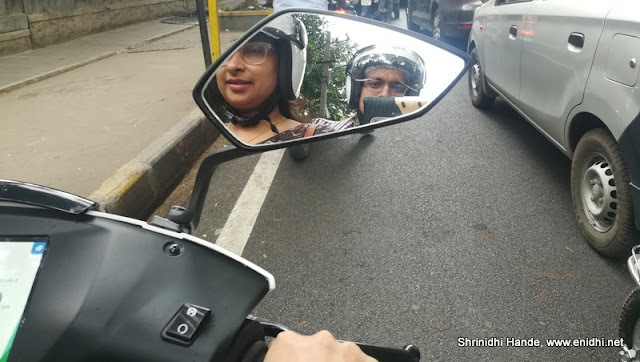 If you’re in Bengaluru and considering a two wheeler, do check out Ather. Also lot of things can change over time- 2 years down the line petrol may be more expensive, electric vehicles may get a bit cheaper and make more economical sense. I don't know why they are not bundling a solar panel roof setup on the top. We get additional charging/range as one drives and protection from rain. This is an awesome review,contains all the necessary info and details. A worth reading blog you shared on Electric Scooters for anyone. As an electric vehicle provider, we appreciate this blog, thanks for sharing this informative blog.